For other uses, see As above, so below (disambiguation). As Above, So Below is a 2014 American thriller film written and directed by John Erick Dowdle and co-written by his brother Drew. It is presented as found footage of a documentary crew's experience exploring the Catacombs of Paris. The film was produced by Legendary Pictures and distributed by Universal Pictures, making it the first film in Legendary's deal with Universal. The film was released on August 29, 2014, and stars Perdita Weeks, Ben Feldman, Edwin Hodge, François Civil, Marion Lambert, and Ali Marhyar. Scarlett Marlowe, a young alchemist, is searching for the philosopher's stone, a legendary substance capable of turning base metals into gold and granting eternal life. After finding a Rose Key and narrowly escaping a cave collapse in Iran, she travels to Paris, where she enlists the help of her ex-boyfriend, George, and cameraman Benji. They use the Rose Key to translate the headstone of Nicholas Flamel, who wrote about the philosopher's stone. The headstone contains a riddle that leads them to believe that the philosopher's stone is hidden 370.5 feet underneath the streets of Paris. Scarlett also enlists the help of a guide named Papillon, his girlfriend Souxie, and their friend Zed, who are familiar with the layout of the Catacombs of Paris. George refuses to follow the group into the catacombs, but is driven underground with the rest when a policeman spots them trespassing. Before crawling through a narrow tunnel which collapses behind them, they encounter female cultists who appear to be performing a mysterious ritual. The group then find themselves in a blocked tunnel that Papillon is reluctant to enter, as people who have entered have never been seen again. After venturing deeper into the catacombs, the group encounter La Taupe, a friend of Papillon who disappeared into the catacombs years earlier. He agrees to guide them out, explaining that the only way out is down. They eventually find a tomb filled with treasure, as well as the philosopher's stone. Removing the stone, Scarlett realizes that the treasure is a trap, and the chamber collapses. With the philosopher's stone, Scarlett is able to heal injuries that Souxie sustained in the fall. La Taupe is lost under the rubble, and the group decide to leave him behind. The group find a Gnostic Star of David, which symbolizes the notion "As above, so below." Seeing that a door has been drawn onto the ceiling above, Scarlett finds a real door in the floor below. Beyond the door, the group finds the entrance to a tunnel that is marked with the phrase "Abandon all hope, ye who enter here" in Greek, identical to the entrance to Hell in Dante's Inferno. Passing through, they find a reflection of the room they left behind. There, they discover La Taupe, who kills Souxie before disappearing. The remaining members of the group realize that they must continue deeper into the catacombs in order to escape, and they climb down a hole. However, Benji is pushed to his death by the lead female cultist. Leaving his body behind, the rest encounter a man sitting in a burning car, which recalls an incident in which Papillon was forced to leave someone to die in a car crash; the man pulls Papillon into the burning car before it disappears and Papillon is left buried upside down. The rest of the group are unable to pull Papillon from the ground, and they decide to continue into the catacombs. Visions of demons follow the group through dark tunnels, and one attacks George. After the philosopher's stone fails to heal his injuries, George murmurs, "Vitriol." Remembering the word from a riddle, Scarlett realizes that the stone itself is yet another trap. Only by returning it will she find the real philosopher's stone. As she races back to the tomb, she finds a hanged man, whom she recognizes as her father. She apologizes to him for not answering the phone the night that he killed himself. She then returns to the tomb, where she finds a polished mirror that makes her realize that she possesses the magical abilities of the philosopher's stone. Scarlett returns to George and heals him with a kiss. She then explains to George and Zed that the only way to escape is to admit to their torments, just as she admitted that she feels responsible for her father's suicide. George admits that he accidentally allowed his brother to drown when the pair were kids because he got lost looking for help. Zed admits that he has a son he knows is his, but chooses not to acknowledge, which explains the visions of a running boy he has been seeing during their journey. As the demons continue to chase them, the group jump down a deep hole. At the bottom, the hole above them closes and a manhole appears on the ground below. Jumping through, the group find themselves right side up on a street overlooking the Notre Dame. Scarlett and George hold each other, realizing that they are safe, while a dazed Zed walks away into the night. With permission from the French authorities the film was shot in the real catacombs of Paris. There was very little use of props, as the actors had to use the environment around them. Production in the actual catacombs was difficult for the cast and especially the crew as there was no electricity or cell phone service in the centuries-old tunnels. As Ben Feldman suffered from claustrophobia, he had to keep taking breaks to cope. The first trailer of the film was revealed on April 24, 2014. YouTuber PewDiePie and his girlfriend Marzia Bisognin promoted the film by embarking on a quest into the catacombs, where they would be scared in a variety of ways. 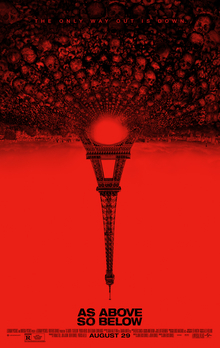 As Above, So Below was released on DVD and Blu-ray on December 2, 2014. On Rotten Tomatoes, the film has an approval rating of 25% based on 72 reviews and an average rating of 4.4/10. The website's critical consensus states, "After an intriguing setup that threatens to claw its way out of found-footage overkill, As Above, So Below plummets into clichéd mediocrity." On Metacritic, the film has a rating of 38 out of 100 based on 23 critics, indicating "generally unfavorable reviews." Peter Debruge gave the film a mixed review in Variety, writing, "It all makes for clumsy-fun escapism, not bad as end-of-summer chillers go, but small-time compared with other Legendary releases." Debruge called the ending "unspeakably corny." Bruce Demara wrote in The Toronto Star, "As Above, So Below has some good scares and a decent cast. But it's yet another found footage thriller, so jittery camera sequences may induce nausea." Drew Hunt expressed similar sentiments in The Chicago Reader, writing "An intriguing and intensely creepy premise is squandered on this rudimentary found-footage horror film." Terry Staunton gave the film a mildly positive review in Radio Times, stating, "It's a perfectly serviceable addition to the 'found footage' genre of chillers from director/co-writer John Erick Dowdle (Devil), who puts cameras in each character's helmet, allowing quick cuts from one scene to another. But despite the claustrophobia of the setting, he never quite racks up enough tension for a full-on fright-fest." The entertainment oriented website JoBlo wrote, "Not the worst example of found footage by a long shot, and it moves a decent pace with a couple of good scares. However, this could have been a far more frightening feature if only it had expanded on its scary premise." The film grossed $8.3 million its opening weekend, finishing in 3rd place. As of November 4, 2014, the film had grossed $21.2 million in North America and $18.9 million in other territories, for a total gross of $40.1 million. ^ "AS ABOVE, SO BELOW (15)". Universal Studios. British Board of Film Classification. August 11, 2014. Retrieved August 13, 2014. ^ "As Above/So Below (2014)". British Film Institute. Retrieved December 23, 2015. ^ a b "As Above, So Below - The Numbers". Retrieved September 2, 2014. ^ a b c "As Above, So Below". Box Office Mojo. ^ Kroll, Justin (April 22, 2013). "Legendary and the Dowdle Brothers to Make Low Budget Thriller". Variety. Retrieved March 7, 2014. ^ Kroll, Justin (January 30, 2013). "Legendary, Universal Date Guillermo del Toro's 'Crimson Peak' for October 2015". Variety. Retrieved March 7, 2014. ^ The Deadline Team (June 26, 2014). "Universal Pulls 'The Loft' From Sked, Moves Legendary Pic 'As Above/So Below' Into Slot". Deadline Hollywood. ^ "Filming in the Paris Catacombs". Retrieved September 29, 2014. ^ Anderton, Ethan (April 24, 2014). "Explorers Find the Gate to Hell in 'As Above, So Below' Horror Trailer". Firstshowing.net. Retrieved April 25, 2014. ^ Bauckhage, Tobias (August 29, 2014). "Social Media Buzz: 'November Man' Labors to Overcome 'As Above, So Below'". Variety. Variety Media, LLC. Retrieved March 16, 2015. ^ "As Above, So Below DVD Release Date December 2, 2014". ^ "As Above, So Below (2014)". Rotten Tomatoes. Fandango Media. Retrieved August 21, 2018. ^ "As Above, So Below Reviews". Metacritic. CBS Interactive. Retrieved September 4, 2014.